Because an extensive, well maintained network of roads is essential for economic development, road construction and maintenance projects have been a mainstay of the World Bank’s lending portfolio since its founding. This long experience in the roads sector is reflected in favorable project evaluations. The Bank’s Independent Evaluation Group reports that roads and other transport projects consistently score higher on measures of outcomes, institutional development, and sustainability than non-transport projects and the Bank’s Quality Assurance Group has found that roads projects are well-supervised. At the same time, roads projects around the globe remain plagued by fraud, corruption, and collusion. A Transparency International poll ranked construction as the industry most prone to corruption and a survey of international firms revealed that companies in the construction industry were more likely than firms in any other sector to have lost a contract because of bribery. World Bank-financed projects are not immune. Roughly one-fourth of the 500 plus projects with a Bank-funded roads component approved over the past decade drew one or more allegations of fraud, corruption, or collusion; to date, the Bank’s Integrity Vice Presidency (INT) has confirmed allegations in 25 projects resulting in 29 cases of misconduct under Bank rules. The most common forms of wrongdoing in these 29 cases are collusion among firms bidding on a project and fraud and corruption in the execution of the resulting contract. The Bank has controls to reduce these forms of misconduct—procurement process reviews, financial audits, and field supervision—and evidence suggests that losses in Bank-financed programs are less than in those not subject to Bank oversight. Nonetheless, for the developing countries of the world, any loss on a road project, whether funded by the World Bank or not, is unacceptable. 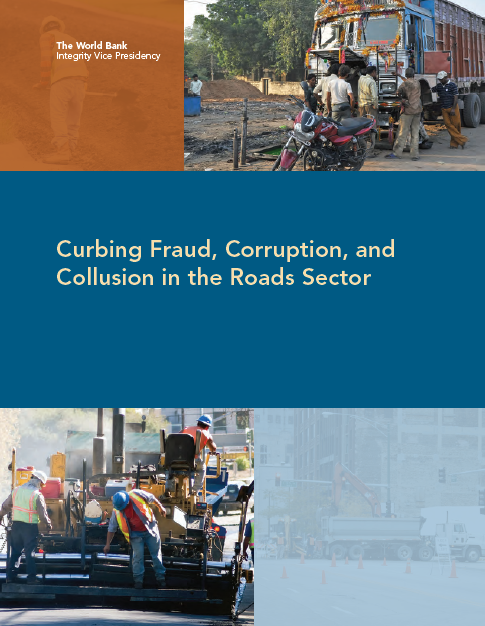 This report explores how the World Bank and developing nations can reduce losses from collusion in procurement and fraud and corruption in contract execution, drawing on what INT has learned from its investigations of Bank-funded roads projects, investigations and reports by borrowing country governments, and the experience of developed countries. The aim is twofold: (a) to provide input into the World Bank’s review of its policies and processes as part of the ongoing reform of its business model, and (b) to inform a broader dialogue on ways to prevent collusion in procurement, and fraud and corruption in contract execution in all roads projects—no matter the funding source. The report begins with a review of the findings in 29 cases of misconduct in World Bank-funded projects. It follows with an analysis of the incidence of collusion in procurement in non-Bank projects and estimates of its impact on project price. It then examines measures developed countries have taken to attack collusion and suggests how they can be adapted to the environment in developing countries. Some steps will be the same regardless of the country context. A country should have laws penalizing bid rigging, market division, and other forms of collusive behavior along with the commitment and capacity to enforce them. Other steps will depend upon the market conditions and other country-specific circumstances and risks. Some countries may wish to limit subcontracting or revise the rules governing how firms qualify to bid on contracts. Other countries may decide that more significant changes in procurement procedures are required. The report suggests that in considering such reforms, trade-offs may be required to ensure that the values of transparency, capacity-building through subcontracting, and other goals are pursued in a manner that does not inadvertently limit competition by facilitating collusion. While preventing fraud and corruption during the execution of a road contract should be everybody’s job, the standard road contract used by the World Bank and most developing countries assigns this responsibility to the consulting engineer. The engineer approves all payment requests and change orders, ensuring in every instance that the road is built according to specifications and that value for money is received. The engineer is thus the guardian of project integrity. In World Bank supported projects, however, INT has found instances where the engineer was asleep at the post and others where the post was altogether deserted. Strengthening the engineer, changing the incentives faced on the job, or even retaining a second guardian to guard the first guardian are some of the suggestions the report advances. A need to appoint someone to guard the guardian is a sign of a systemic problem and INT’s findings echo earlier reports by governments, NGOs, academics, and donor agencies; collusion and corruption are sometimes deeply ingrained in the roads sector. The schemes may involve not only firms but roads agency personnel and even senior officials. In these later cases, the system feeds off itself. The higher the colluders raise the price, the more they can pay in bribes and kickbacks. The more they pay, the more they have to cheat the government to make a profit. The more corruption, the more all wrongdoers stand to gain. Thus all have a shared interest in business as usual. When collusion or corruption is systemic, change requires breaking the cycle of abuse by bringing in someone from the outside—a prosecution service, anticorruption agency, competition law authority, supreme audit institution, or, in the case of a local government, the national government. If senior officials are involved, introducing an outsider can be particularly challenging. When corruption is deeply ingrained, short-term palliatives, such as an independent procurement evaluator or technical auditor, may be the answer. More drastic measures may also be required and the report reviews three: the use of bid ceilings, competitive negotiation, and turning procurement over to an independent agent. Not all corruption is systemic, and thus not all reforms require such significant steps. In the World Banksupported Bali Urban Infrastructure Project, the circulation of tender notices to firms in other provinces defeated a local bidding ring. In the Philippines, civil society monitors uncovered corrupt schemes in a variety of government contracts, and in the second phase of the National Road Improvement and Management Project, civil society groups will monitor all phases of the work. The report suggests that, in addition to expanding project-level preventive measures, more attention should be paid to project supervision, especially in high-risk environments, with a particular focus on verification of cost estimates and the identification of collusive bidding. A review of the World Bank’s supervision strategy for roads projects may also be in order, something that might include ensuring that seasoned road engineers are available to assist clients and enhance technical supervision of the projects. None of the steps recommended are costless, but the losses from collusion, corruption, and fraud can be substantial. This report seeks to spur a dialogue inside and outside the World Bank on how to more effectively combat collusion, fraud and corruption and thus produce better development outcomes.